When A-list Hollywood talent like Leonardo DiCaprio and Brad Pitt sign on to star in film project, that’s usually a good indicator that everything else in the film is going to come correct. Budgets, cast, and script will be under increased scrutiny, and this means that movies involving stars are a safer bet than your average film. This is the case with this film, which is pretty remarkable considering its $15 million budget. 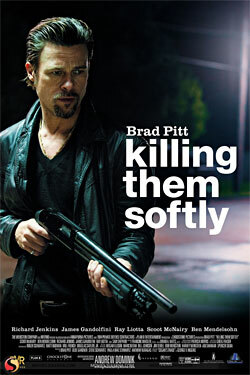 Killing Them Softly is a 2012 neo-noir crime drama starring Brad Pitt and featuring Ray Liotta and James Gandolfini. Surprise: they play Italian gangsters. Liotta’s character, Markie, runs an illegal poker ring which is a popular hangout for Boston criminals who are betting large stacks of cash. After the poker ring is robbed by armed gunmen, Markie confesses to the mafia that he orchestrated the robbery and is forgiven. But it’s not long that the poker ring is back in action that someone else draws up plans to rob the same poker ring, intending for the blame to land on Markie again. After the second robbery happens, Brad Pitt’s character, Jackie, is summoned to find and kill those responsible. To avoid the emotional exchange of face to face murder, he prefers to kill at a distance, which he calls killing them softly. The writing and dialogue in this film is sharp, and the performances are solid. Brad Pitt’s character in particular is a good match for him, as he rarely plays this kind of gun-toting sort. This is a character-driven film punctuated by brief but violent action sequences, which makes it feel a lot like Goodfellas or Casino. An interesting facet of this film is its recession-era backdrop. There’s a TV or radio playing in the background in a lot of scenes, and in each instance you can hear Presidents Bush or Obama talking about the 2008 financial crash, making it apparent that the film is set in 2008 amidst the peak of the American recession. Several characters reference the economy and recession, too. Since all characters in this film are at varying grades of moral bankruptcy, there’s a grit and desperation in their actions: their backs are at the wall, and they’re doing what must be done to survive. There’s a political and social narrative of anarchy and individualism in this film, and the moral seems to be that you cannot rely on anyone but yourself. It takes a long time to build up to its conclusion, but when it does, Killing Them Softly packs quite a punch.